Welcome to the Great Groves web site. 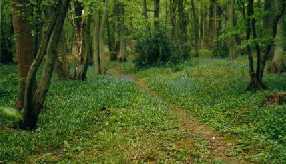 Great Groves is an ancient semi-natural woodland of 18.2 hectares situated in East Hertfordshire in the UK. It is part of the Broxbourne Woods complex (grid ref.Landranger sheet 166 319085). The main timber species are oak and ash with a hornbeam understorey. There are also 12 mature wild service (Sorbus torminalis) trees and many saplings. Great Groves is a hilly wood. 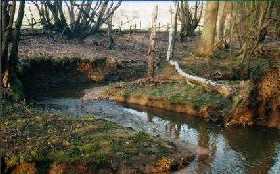 A small winterbourne bisects it from south to north where it joins Bayford Brook as it meanders along the north side at the foot of a steep cliff. The soil is mainly chalky boulder clay and London clay but there are also patches of lighter sand and loess. Two blocks of the woodland are not ancient semi natural woodland. The first, Grays Plantation was a field until 1919, the year the Forestry Commission was founded. It contains a small stock pond fed by a spring. It was planted up with a variety of trees in 1919. The second area which is not ancient semi-natural woodland is called the Woodland Garden and it was probably mown grassland until the last war. Two large lime trees stand in the middle. When mowing stopped the grassland was taken over by scrub, especially birch and hawthorn together with some hornbeams and occasional oaks. Nowadays in spring thousands of daffodils form a dazzling display amongst the trees but who planted them and when we do not know. We would very much like to know how you came to visit this site. Please click here to leave your name in the address book. If you would like to hear from us with our occasional Email newsletter please leave your contact details - they will be kept strictly confidential and not given to any third parties.